This section of blog teaches you how to develop a Java EE 6 enterprise application in NetBeans IDE. It also helps you understand some of the EJB 3.1 technology features. In this section of blog you will create an Enterprise Application called as "Online Tweeter Enterprise Application". Online Tweeter Enterprise Application - It is a simple Java EE application that allows user to post tweets and receive tweets from the database. It can also allow other users to view tweets posted by the current users. It also allows other users to tweet and notify other users about their statuses. This application will contain two modules such as EJB module and Web module. In this series tutorials say in parts you will get step by step procedure of developing this application. It will start with EJB module which will contain a Entity class, a Session Bean for Entity class and a Message Driven Bean. After EJB module, you will develop Web module which will have JSP and Servlets, along with a singleton session bean. 1. Web Tier: It will have JSPs and Servlets for the presentation view of the application. 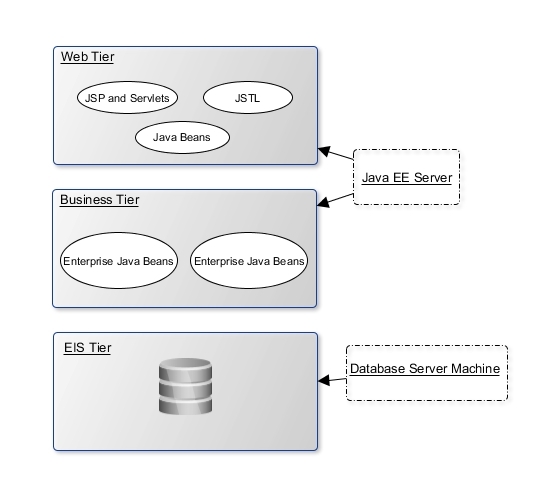 2. Business Tier: It will have EJB module for the business logic consisting of Enterprise Java Beans. 3. EIS Tier: It just represent persistent layer where all the tweets by an user will be stored. All of the above modules will be packaged into a EAR archive. Web module will go in WAR archive. EJB module will go in JAR archive. Part 1: Creating the Enterprise Application in NetBeans IDE. Part 3: EJB module - Creating an Entity class. So lets start/continue this application with part 1.